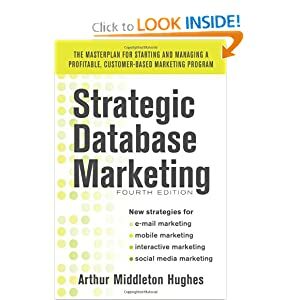 When talking about marketing databases, most people think of customer databases complete with their transaction and promotion history. These databases are used to develop communications that promote loyalty, retention, and cross sales. In the past few years a number of companies have been developing databases of prospects (who are not customers) designed to improve the customer acquisition process. Until recently, a prospect database has been difficult to create. List owners typically rent their names for one time use. Keeping those names in a database where their performance could be measured was considered an illegal or unethical secondary use of the data. This is rapidly changing due to the efforts of a number of creative service bureaus working with compiled names and cooperative list brokers. In the old days, a list owner had a unique product: people who had purchased his products or subscribed to his periodicals. There are more than 20,000 such lists. During the last decade, however, a number of service bureaus have been able to compile the spending habits of just about every mail responsive household in America and append these lists with transaction and demographic data that enables them to model the prospects to predict their likelihood to purchase certain products. There are many companies that have been creating such files. In this editorial, I will cover two: the Abacus Alliance with catalog purchases of more than 90 million households, and AmeriLink from KnowledgeBase with demographics and transactions covering more than 110 million US households. The Abacus Alliance, formed in 1991, has more than 1,800 catalog members who furnish the Abacus database with all their customer catalog transactions on a monthly basis. Abacus members who want prospects for mailing a new catalog can go to Abacus asking, for example, for one million prospect names that match the spending behavior of their existing customers. Since Abacus already has the cataloger’s existing database, they are able to run a model and score the 90 million households in their prospect database to come up with a million names that work well for the cataloger. It is a wonderful system which has played a significant role in the success of the catalog industry. The AmeriLINK database contains 230 million consumers by exact age, 50 million by purchasing behavior, and100 million mail order buyers and responders. Using this file you can reach consumers by purchase transactions, lifestyle interests, where they live, ethnicity, and occupation, families with children, homeowners, donors, and veterans. AmeriLINK has over 90 million seniors and adds 250,000 new movers every month. All records have zip coded home addresses, and many also have email addresses. Similar products are available from InfoUSA, Donnelley Marketing and others. Like the Abacus Alliance, marketers can purchase AmeriLINK names to build their prospect databases, or to append purchasing data and demographics to their existing customer or prospect database. Once the prospect database has been created, the fun begins. A typical mailer may use external sources to create an eight or ten million name prospect database maintained at a service bureau. In a typical situation, the mailer sends several million pieces out every month. Using the responses to the mailing, analysts at the service bureau use a model to determine what are the behavioral and demographic factors that predict who would be the most likely responders. The model is used to score the prospect database. The next month’s mailing is selected from those households with a high score (most likely to respond). 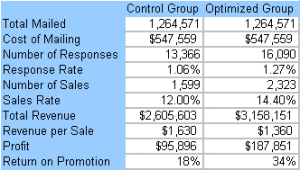 As a result, the response rates get higher and higher the longer the prospect database is used. Summit Marketing, created a prospect database for an insurance company that mailed 1.2 million pieces per month. Using a model, the insurer increased their sales by more that a half a million dollars per month. Mutual of Omaha conducts 35 first-party mailings and more than 250 third-party campaigns to Mutual of Omaha’s partner companies’ membership base. The company asked KnowledgeBase to set up a prospect database to handle these mailings. Mutual of Omaha estimates that it saved more than $1 million last year from reduced package costs, lower list costs, and other improvements involved in their prospect database. Globe Life and Accident Insurance Company created a prospect database for one of their major programs. They used modeling techniques to predict best responders and those likely to pay. Use of the database increased their response rate by 26%, and increased paid premiums by 270%. How and why does a prospect database work? Reducing wasted mailing through improved identification of seasonal/vacant addresses, deceased individuals, and mail file duplicates. Individual mailers cannot afford to keep up on the available data on all the suppression files. A service bureau, handling prospect databases for dozens of clients, can do a better job. Reducing fraud and no-pay situations by eliminating highest risk prospects. Credit data can be used to assure that only qualified prospects are mailed. Reducing in-house staffing costs by outsourcing the prospect database work. In most cases, outsourced solutions produce results at a lower cost per transaction. Re-negotiation of list contracts to a more favorable net name basis. The list brokers have seen the hand writing on the wall. They are more willing to play ball with an advanced prospect database. Blending lower cost compiled names with appended behavior from external lists. With a prospect database, it is possible to combine behavior and demographic information about a household from several lists, paying each list owner for his contribution to the overall mailing program. Long term use of demographics and behavior. Without a prospect database, a mailer has only name and address files to work with. He can identify the multi-buyers by finding duplicates among the lists. But he does not know much about each prospect’s income, age, home value, or buying behavior. He can get such data appended to his mailing file, of course, but the cost of doing this for a single mailing is prohibitive. The savings through discarding the less productive names do not pay for the cost of the appending and modeling. The prospect database changes all that. The database is going to be used for several months, or a year. It becomes profitable to append data to the file and use the results all year long, modeling and selecting the high scoring names for each mailing. Conclusion: If you are still acquiring customers by renting lists, merge purge and mailing to them, you are behind the times. You should consider building a prospect database to improve your response rate and reduce your costs.